A depot that accommodates 850 buses is being built at the premises of the headquarters of the Anbessa City Bus Services Enterprise in Yeka district. The construction is expected to commence next May.Resting on 10ha of land and consisting of four-storey bus bays, it is expected to be able to maintain and inspect 50 buses and have washing bays that can serve 12 buses each at a time. It will also have a fuel station, dry cleaning and generator room, water reservoir with pump house, water recycling plant and wastewater treatment plant. The administrative building rests on 3,500Sqm of land and comprises a dispatch facility at one wing and a business centre on the other to generate sustainable income for the bus depot. It has two basement parking floors for 120 vehicles at a time.The project is in the process of hiring a contractor, for which the Transport Programs Management Office of the City Road & Transport Bureau is carrying out a prequalification assessment before it floats a tender. The detailed design of the project has already been completed by SYSTRA SA, a French consulting company with 27 years of experience. 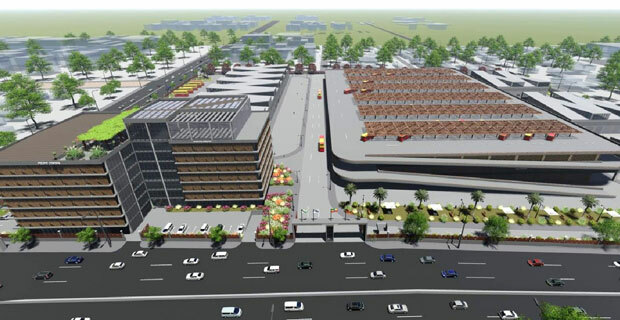 Negash Tamiru Zewde, in a joint venture with ENSIRAD Civil Engineering Solutions, conducted the environmental and social impact assessment.The Yeka bus depot is one of three such projects currently being undertaken in Addis Abeba. Two other bus depots located in Shegole and Qality are in the completion stage and will be operational in two months. The depots, which will be transferred to the management of the City Administration for use by all bus transport providers, cost the city 1.3 billion Br. An additional depot at Mekanissa is expected to accommodate 450 buses and is in the design stage.Addis Abeba has 188 public service buses, 240 Sheger public buses, 86 Sheger student buses and 64 Alliance City Buses. The Anbessa City Bus Service, a 75-year-old transportation company that has 3,500 employees, has 366 buses, 270,000 commuters a day and 106 routes in Addis Abeba.Berhanu Zeleke (PhD), a lecturer at Kotebe Metropolitan University’s Urban Transport Management department for the past two decades, has an optimistic view of the outcomes of the bus depot projects. However, he believes that the solutions should forecast the rapid dynamism of urbanisation and focus on other fast and cost-effective transportation systems that suit the city.“The planners should focus on the expansion of light railways and cable transportation systems,” said Berhanu. “They have low operating costs and serve more commuters with sustainable quality and speed.